With all the sweets and rich foods around the house this time of year, I find myself craving greens and nutrient-dense foods more than ever. 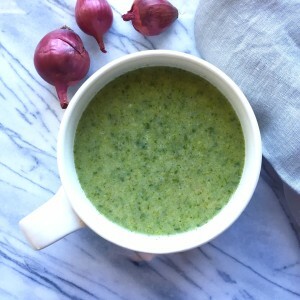 I still enjoy my fresh green juice most days (loads of greens, half a green apple, the juice of one lime, and a cup of coconut water all blended up and served over ice), but when it’s cold, I need a warming mug of soup to deliver all the healthy goodness of the vegetables my body craves. This detox soup is perfect for any time of year, but especially good between those big meals with family and friends when your body needs a break from heavy foods and sweet treats. It’s simple to make, is grain-free, dairy-free, paleo, Whole 30 and 21-Day Sugar Detox compliant, and can be made vegan (sub in vegetable stock for the chicken stock). Combine all ingredients except the salt, pepper, and optional collagen into a soup pot. Bring to a boil and then reduce heat to simmer for approximately 20 minutes. Pour all ingredients into a high speed blender and blend until smooth. Mix in Vital Proteins collagen peptides for added protein if desired. I love to add this to soups, tea, or coffee when I’m needing additional protein and gut-healing benefits. It blends right in and doesn’t change the taste. Pour soup into mugs and season with sea salt and pepper and spices of choice. Enjoy your bowl of this nutritional powerhouse of a soup while it warms you up and supports the body’s natural detoxification! I was craving an extra side of nutritious veggies tonight to go with our already whole30 dinner, so I made this. It was just what I needed. Thankful my husband liked it too. Thanks for the recipe!